Your house is stocked full of appliances of all sizes. While life becomes tenfold more convenient with these handy machines, it also equates to more risk to your finances. When a trusty appliance goes on the blink, life can become stressful in a hurry. All Good Appliances specialises in appliance repair services and can quickly and efficiently help you with your electronic apparatuses. However, any time we can save you a few bob we will. Regular inspection and maintenance can save serious currency in the long run and we fully recommend it! All Good Appliances is your resource for appliance services and repairs. 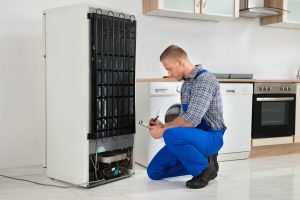 Doing regular maintenance and inspections on your appliances can save you money in the long run. Don’t wait until your essential machines go mad and turn into expensive piles of metal. Swap out those costly repairs for simple checks and replacements. Striving to stay ahead of the curve is our best recommendation. Contact us today for any of your appliance concerns!